On April 19, 1775, after a shot was fired in a conflict between an elite group of Colonial Militia, known as “Minutemen,” and British Soldiers, the Minutemen pursued retreating British Soldiers from Merriam’s Corner in Concord to Prospect Hill in Somerville. Ralph Waldo Emerson coined the first shot of this historic day, “the shot that was heard around the world,” this gunshot started the American Revolution. The “shot” location has been attributed to the Old North Bridge in Concord and the Lexington Battle Green in Lexington, both historic points of interest in the area. A tribute to this historic pursuit was the creation of a 15 mile BSA National Historic Trail, the “Minutemen’s Pursuit Trail,” which is a new historic trail in the Spirit of Adventure Council. On April 19, 2017, exactly 242 years after what was one of the most significant points in the freedom of our country, which led to the creation of the greatest democracy in the world, I had the privilege to be one of five Scouts (three from Troop 11 in Dorchester, two from Troop 132 in Concord) and two leaders to take part in the inaugural hike of the Minutemen’s Pursuit Trail. The trail consists of three primary legs, which is the actual trail, and two adjunct legs. We hiked the three primary legs and one of the adjunct legs so we could qualify the hike for Hiking Merit Badge, requirement 5: a one day 20 mile hike. 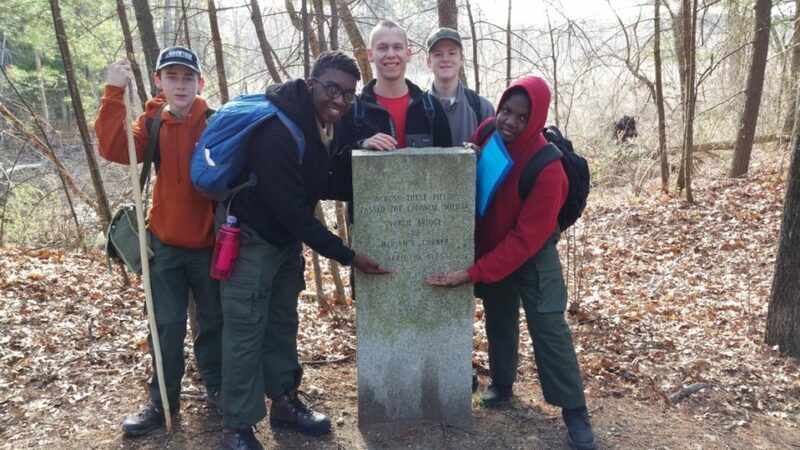 Several of the Scouts hiking the trail also applied the 20 miles to the Hiking Segment of the National Outdoor Achievement Award. The trail provides an opportunity to experience many points of historical importance including: Minuteman National Park, Captain William Smith House, Lexington Battle Green, The Foot of the Rocks, Old Schwab Mill, Menotomy Indian Hunter Sculpture, Jason Russell House, Uncle Sam Monument, Whittemore Park, and the concluding point of the trail – Prospect Hill in Somerville where the first America Flag was flown. On our hike we had the opportunity to meet Captain William Smith (a reenactment actor) who played his fife and travelled with us for several miles on the trail explaining much of the history of the area. We completed our hike ascending the many steps to the top of Prospect Hill Tower, which has one of the best views of Boston. I would like to thank the Somerville Department of Public Works for opening the tower for us on April 19, 2017. A unique part of the trip for the Scouts from Troop 11 in Dorchester was the experience we had taking the MBTA Commuter Rail from North Station in Boston out to Concord to meet our fellow Scouts from Troop 132 in Concord. The cost was very reasonable at $4.50 per Scout and it was really nice to experience the train ride. 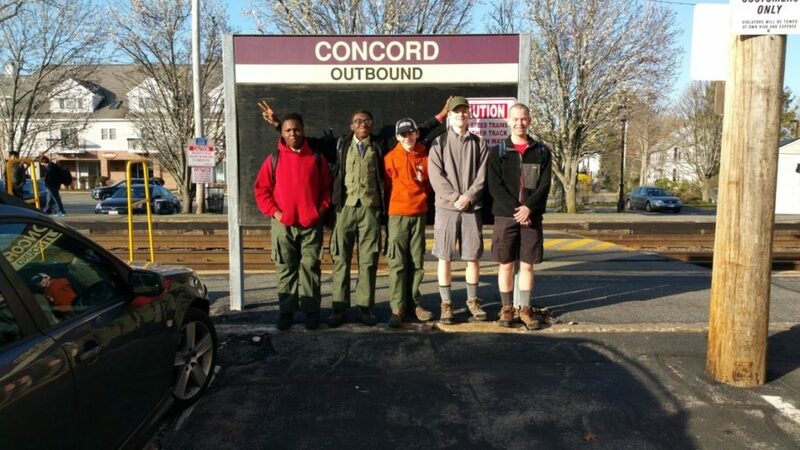 Having public transportation out to Concord, from the middle of Boston, opens up a world of opportunity for Scouts in the urban areas of Boston to experience their own pursuit of our nation’s history. 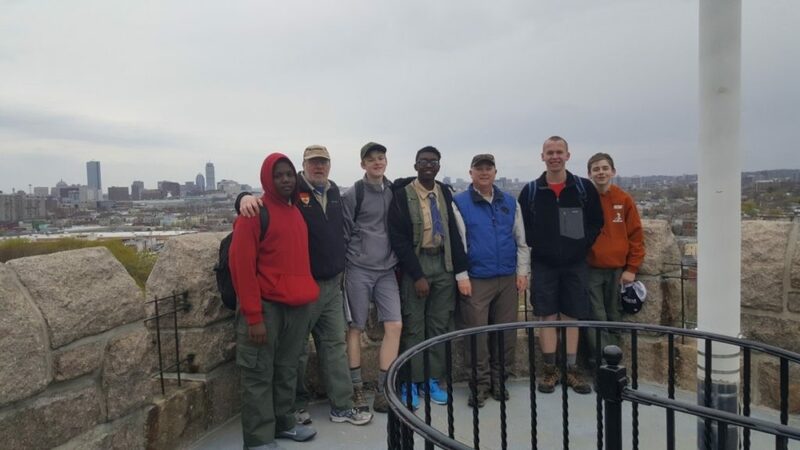 The train ride makes it very convenient for Scouts visiting the Boston area from all over the country to experience an awesome historic hike. I highly recommend the Minuteman Pursuit Trail. We stopped for Ice Cream at Rancatore’s in Lexington and had a late lunch at the Menotomy Grill in Arlington which has many historic flags, Revolutionary War reproductions, and great hamburgers! The Minutemen’s Pursuit Trail is very well documented and there is a Minutemen’s Pursuit Trail Medal a Scout can earn by completing a questionnaire about some of the historic points on the trail. I love the history of our great area in the United States. I hope Scouts will seize the opportunity to explore a lot of our Nation’s history on the Minutemen’s Pursuit Trail. I give this trail a 10 star rating! 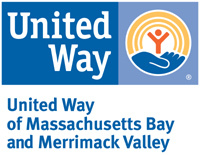 On April 19, 2018, there will be the 1st Annual Minutemen’s Pursuit Trail hike. This will be an awesome opportunity for Scouts from all over the country to take part in a historic hike to commemorate the original pursuit 243 years later.